Wolf is the best crime movie you've never heard of and sadly have no chance to see anytime soon. So why are we writing about it? Well, because Wolf is the best crime movie you've never heard of and sadly have no chance to see anytime soon. Unless some very smart U.S. distributor picks it up, that is. The greatest joy of going to a film festival isn't getting to talk to filmmakers or spotting celebrities on the red carpet, it's discovering something amazing that you had no idea even existed. 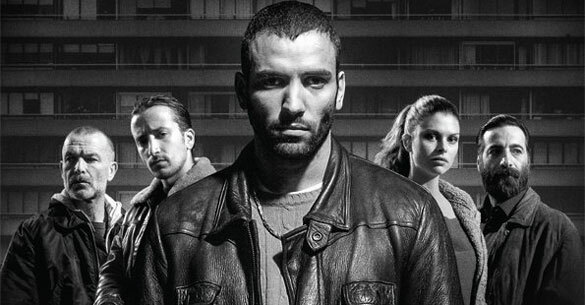 Case in point, this exceptional film about a kick boxer drifting into the world of organized crime in the Netherlands. Movies about a young guy getting mixed up in the criminal underworld have been so common for so long that even when they're good they rarely feel like they're bringing anything new to the table. Watching Wolf, however, felt like seeing the arrival of two massive new talents that simply cannot be ignored. Seeing what writer-director Jim Taihuttu and actor Marwan Kenzari are capable of this early on in their careers is like watching Scorsese and De Niro, or David Fincher and Brad Pitt, or Jeff Nichols and Michael Shannon, or, well, you get the point. These are two talents in total sync with one another, and together they're creating a portrait of a modern man trapped in life by the weight of his own talent. Kenzari plays Majid, a man who has already been to jail once for petty crime, but who is trying to live a simple life doing the one thing he knows: beating people up. He tries to go the legit route as an amateur kick boxer, but when a Turkish mob boss sees what he's capable of, he offers him a new path. He starts as just an enforcer for drug deals, but as is always the case, things start getting more and more serious. And yeah, it's a story you've seen done before, but what makes Wolf stand out (even beyond the sheer talent of Taihuttu and Kenzari) is how it handles Majid and the idea of street criminals in general. He's not someone seeking out this lifestyle. He doesn't want to be the next Tony Montana. He doesn't want to rob banks. He's not in it for fast cars and supermodels or anyone's approval. It's just a job to him. It's the kind of work he's good at, and it pays well, and he uses that money to support his disapproving family and dying brother. Wolf also does something that's rare for crime movies, especially these days: it approaches everything from a casual, blue-collar mindset. The players have no obnoxious sense of entitlement. All too often these movies are about how the rich deserve to be robbed, or how people and companies who already have more than they need deserve to be bled out. But Wolf doesn't go that route. It's not the underdog versus the fat cat. There's an acceptance that these are guys living life the only way they know how, and that's not only refreshing, but it's authentic. Wolf isn't the Hollywood version of this story, it's the kind of movie Hollywood ruins with a remake. And that's just all the script. The actual execution of it is quietly good, old fashioned, exceptional filmmaking. These days making a movie in black and white often feels like an arbitrary decision in a "we don't have any other ideas to make it stand out, so let's just do it in black and white" kind of way. Not with Wolf. The black-and-white cinematography here is stunning and traditional. It's not high contrast with extreme blacks and blinding whites. It's full of greys that give the movie a natural look that strips it free of distraction, leaving you to focus all of your energy on the characters and the remarkable acting. All of the supporting players are terrific, but this is Majid's show and Marwan Kenzari has the kind of pure star potential that's magnetic. He's charming and innocent but also exudes a power that can quickly get out of control. And ultimately that relationship is exactly what Wolf embodies. It's about men who are born with more power than what they know to do with. Not just muscles and physicality, but raw, untapped capacity as human beings, and the only way they know how to release it is by doing things at the expense of others. Seeing what writer-director Jim Taihuttu and actor Marwan Kenzari can do together is like spotting a volcano bubble up from the ocean floor and create a new island. Their work together is so damned good that it's created an indelible mark on my cinematic map. Whenever I see their names together in the future, I am going to do everything in my power to visit their collaborative island and see what they're up to. Hopefully Wolf has the same effect on a U.S. distributor; one who knows that these two not only made one hell of a film this time around, but are a cinematic force to be reckoned with.